Acapela Group » Short animated video: type in your text, it will turn into a movie! Acapela Group/News & Agenda/Short animated video: type in your text, it will turn into a movie! Short animated video: type in your text, it will turn into a movie! 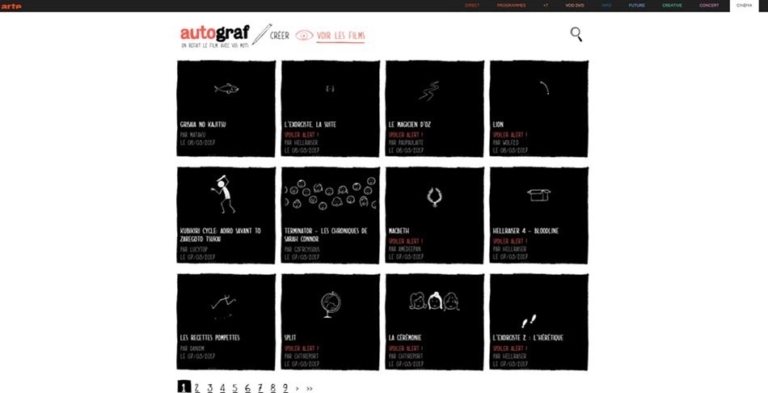 Discover Autograf and create your own short, animated films. Brought to you by TV channel Arte and narrated by Acapela Group French voices. Think of your favourite film or series. Recount the plot, giving us your version using a maximum of 400 characters, and Acapela voices linked to quirky, amusing animation will do the rest. Autograf is intended for a wide audience. The idea was first conceived in 1990 so it has taken many years to come to fruition. Thanks to the tenacity of its creator Joris Clerté and considerable progress in interactive technology, the tool is now online and running. Five months after its launch, over 7000 movies have been created, attracting more than 60 000 views. The internet user recounts their story using a maximum of 400 characters, in his or her own way. When a word is linked to an animated feature, the word is displayed in yellow. The more yellow your story contains, the more animated and funny the result will be. Over 900 words are associated with animated illustrations. Once your story is finished you just need to click. Your story is then moderated, generated and remembered for posterity! Acapela voices play their part, instantaneously transforming your text into voice, perfectly synchronized, as the yellow words transform into drawings. Congratulations, you have just produced your first animated film! You can watch it as many times as you like, share it on social media and tell a new story! Autograf is very easy to use, and is available to everyone. The only constraint is keeping to the 400 written characters. ‘Acapela synthetic voices become part of the magic of animation, transforming the typed text into speech. We have selected several voices from Acapela that are used randomly. You don’t know which voice will be used and the result is always excellent and funny. We have received very good feedback from Internet users’ underlines Barbara Fuchs, Web Publisher and Production Manager at Arte. Autograf is not just about generating films for the community of internet users. It is also a tool for the TV channel to create short trailers and promote programmes. It’s an efficient and entertaining way to keep viewers informed via the Internet and social media. ‘Acapela’s narration combined with the animation gives very impressive results. The synthetic voices can read any written content and we are delighted to hear our voices successfully tell stories created by internet users. Autograf is a very nice tool; participative, interactive and viral’ adds Lars-Erik Larsson, CEO of Acapela Group. Acapela voices are already familiar with the world of cinema and cinematic production. They dub movies, are used as voice overs, provide Audio Description or give a voice to mock ups. Acapela’s portfolio comprises over 100 synthetic voices in over 34 languages. There is a wide choice of voice persona including children’s voices and character or celebrity voices. Specific voice smileys ensure a truly lifelike, spontaneous and lively audio result. Our voices are packed with emotions and reflect the way we talk and interact with the world.